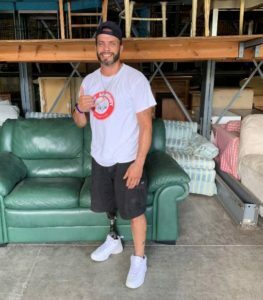 Joseph lost his leg in a motorcycle accident when he was 25 years old and walks with a prosthetic leg. He became addicted to pain pills over the years while coping with his injury. He spent more than two months in a drug addiction treatment program to get his life and health back on track. Joseph, 46, said he lived under a bridge and in a homeless shelter for several months after splitting from his wife and while awaiting acceptance into a drug addiction program. “I’ve been through a past 10 months of hell,” he said. After graduating from his drug treatment program, he obtained help to rent a house. The Mustard Seed supplied Joseph with all the basic furnishings needed to make his house into a home. Joseph said he plans to go back to school to become a motorcycle mechanic and would like to get a job helping others who struggle with drug addiction.